Symbols can, among other things, stand for the ideological elements that characterize a given group or they can stand for the groups themselves. 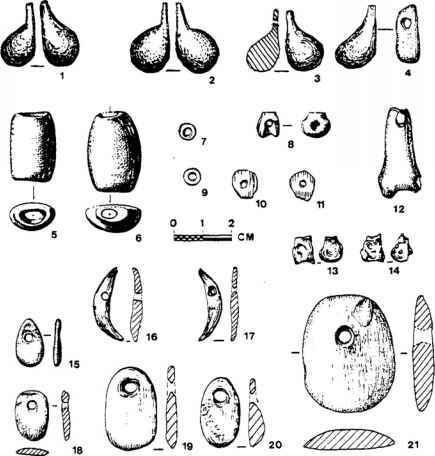 Unfortunately, it is not clear whether the exclusive use of bird motifs to decorate the sculpted fancy pestles from Nemrik 9 (see Kempisty and Kozlowski 1990: Figures 64-68; Kozlowski 1989:29),versus the use of mammalian motifs to decorate the ones from Hallan £emi is one or the other. Burials are also symbolic actions with meaning at a number of potential levels, most of them purely ideological. However, at the level of territorial claim (cf. Charles and Buikstra 1983; Goldstein 1976; Saxe1970) they are suggested to stand for the group that is exercising the claim. In that context, the apparent absence of burials within the site implies certain things about community organization at Hallan £emi. As noted earlier, no human burials have yet been found at Hallan £emi, and, given the current size and depth of the excavation exposure at this site, it has become reasonable to conclude that they simply do not occur within at the site proper. This strongly suggests that human remains were consistently disposed of away from the site in one fashion or another, perhaps in a cemetery. It should be noted that there is apparently a complete absence of human bone at Hallan £emi. Thus, a central cache within the site can probably be ruled out on grounds that, if it exists, at least some human bone would have worked its way into the surrounding general deposits due to postdepositional processes. A cemetery, thought to be associated with the occupation at Zawi Chemi, does exist in the proto-Neolithic levels at Shanidar Cave (Ferembach 1970), a slightly earlier site in the same general region as Hallan £emi, and the use of cemeteries by the broadly contemporary (terminal Natufian) cultures in the Levant is well documented (e.g., see Chapter 2 ofthis volume; Henry 1989). Along the Tigris, as in the Levant, intramural burials do occur at tenth millennium sites, such as Nemrik 9 (Borkowski 1992) and Cayonu (Ozdogan and Ozdogan 1989). The use of cemeteries departs from the mobile hunting-gathering pattern for dealing with the dead. It is also different from the pattern of intramural internment that characterizes the later, fully developed Neolithic cultures of southwestern Asia. In that vein, Charles and Buikstra's (1983) conclusion concerning the organization of archaic central Mississippi drainage (i.e., settled hunter-gatherer) communities is particularly interesting. Following Goldstein's (1976) general suggestion that the use of cemeteries correlates with the corporate lineal inheritance of restricted resources, Charles and Buikstra (1983) suggest that the presence of bluff top cemeteries in the archaic corresponds to corporate (resource controlling) groups consisting of all the residents of the associated small villages, who are also probably all members of single extended families. If so, and if we make the further assumption that the shift to intramural burial later in the Neolithic is indicative of a change in the symbolizing, kin-based, resource-controlling group engaging in the activity (from the community to the household), then the social changes implicit in changing burial practices are also consistent with the changing socioeconomic patterns suggested by Flannery (1972b) to be indicated by changes in architectural design during the Neolithic. group hostility proposed to arise from initial attempts to assert ownership in a mobile hunting-gathering society (see Rosenberg 1994b: 327-328). Both of these, in turn, are consistent with the suggested practice of kin group endogamy at Natufian sites (Henry 1989:208; see also Smith 1973). Single-kin-group communities also help to explain how the community acting as a whole could be the basic unit of production and consumption for valuable imported commodities such as copper ore and obsidian. On the other hand, such a hypothetical form of community organization at Hallan £emi makes puzzling the presence of two contemporary public structures at the site. In any case, such a hypothetical form of community organization raises an interesting possibility concerning the socioeconomic/sociopolitical role played by the feasting suggested by Hayden (1995) to have occurred at Hallan £emi. Specifically,if the Hallan £emi community consisted of a single extended family group, then political power within the community would have been delegated primarily along familial lines. Thus, power relationships within the community would likely have been primarily kinship defined, tradition based, and, consequently, more or less static over the course of adult lifetimes. However, competitive feasting of the sort proposed by Hayden (1990,1992),impliesthe existence of a much more fluid sociopolitical structure than this, for otherwise there would be no point to it. On the other hand, such single kin group community organization is theoretically compatible with a very different kind of feasting. This second possible form is reciprocal feasting on the Yanomamo model as a mechanism to overcome any latent (if not overt) hostility and promote cooperative ties between groups (Chagnon 1983). The sociopolitical ties so established would serve as replacements for those dissolved by the institutionalization of territoriality, to facilitate trade, and conceivably to also facilitate some movement of people between groups through marriage. Given the small size and social restrictiveness of community-equals-single-kin-group equation, such ties would certainly be useful. Moreover, the evidence for long-distance trade, implicitly indicating the existence of some form of ties to other groups, is certainly there at Hallan £emi. Lastly, it was suggested earlier that the organizational changes that distinguish early settled village societies from mobile hunting-gathering ones are not directly rooted in new food procurement techniques (e.g., food production) but in the changing patterns of property ownership that are a prerequisite for the institutionalization of these procurement techniques. Theoretically, at the earliest stages of the transition from mobile to settled lifeways, these social changes could conceivably still be just behaviorally (i.e., expedience) based and not yet be formally legitimized by prevailing beliefs (Rosenberg 1994b). However, it is noteworthy that at Hallan £emi this does not appear to be the case, judging from the association of sym bolic elements (decorative elements) with evidence for behavioral change (artifact types). That is, the socioeconomic and sociopolitical changes alluded to by the abovementioned aspects of the material culture assemblage already appear to be substantially reconciled with the belief system, and vice versa Given the absence of evidence for the existence of settled village communities along the Taurus flanks prior to the establishment of Hallan Semi, it would appear that the sedentary cultural system represented by Hallan £emi coalesced very rapidly. This is expected on theoretical grounds (Rosenberg 1994b) and is consistent with the suggested punctuational pace of similar type changes in the Levant (e.g., Bar-Yosef and Belfer-Cohen 1991,1992).